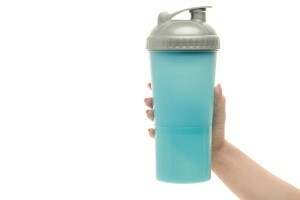 Shaker bottles have become very popular for all sorts of powdered protein or energy drinks that mix with water. This guide has advice for using powdered drink mixes. My grocery budget has been drastically reduced lately due to my husband's hours being cut. Normally, I would buy the powdered flavored water drink sticks for my family to put in bottled water. However, that is now a luxury item that we cannot afford. I had the idea to try the same approach, except in a much more frugal way. I purchased a 10-count box of the flavored water sticks, but I didn't purchase the case of bottled water like I normally would have in the past. Instead, I cleaned out a gallon milk jug and filled it with tap water. Then, to be even more frugal, I only opened two of the flavored water sticks and emptied them in to the gallon jug. This resulted in a weaker version of flavored water, but really one whole stick to a bottle of water always seemed too sweet anyway. I just shook the jug up until all powder was dissolved and put jug in fridge. This will last my family several days for a fraction of the cost of one flavor stick inside one bottle of water! I've never used the flavor sticks, but I have to ask if there is any real nutritional value to them first, and secondly, if there isn't, why not just use the unsweetened packets of Kool-Aid. I really don't know how much the flavor sticks cost, but I'm betting it's a lot more than Kool-Aid. If you really want to be more economical, how about making iced tea? I'm sure that would be a lot cheaper than anything else you could use, and if it's just being used to flavor water, iced-tea would work as well as anything. If you don't want the caffeine, use the Decaf one. things to all our water, I'd think they could take part of that money and start cleaning up our natural water supplies instead of "recycling" it from only God knows where. I try not to think about it too much since they won't allow me to run things around here. When making powdered drinks where you have to add your own sugar; take the sugar and some of the water and heat on stove or in microwave until the sugar dissolves. Finish as usual. Source: My mom did this so I must give credit to her. I do something similar. I just add the sugar and mix then add a cup or two of hot water from the tap to melt the sugar. Once melted I add cold water up to the recommended amount. If you make instant iced tea, or any kind of powdered drink mix, here's a solution to always having undissolved sugar at the bottom of the pitcher. First measure in however many scoops of mix you need into your pitcher. Then put in a couple inches of HOT tap water and swish it around till all the sugar is dissolved. Then you can add a tray of ice if you have a big enough opening, and fill the rest with cold water. No more weak tasting drinks or sugar at the bottom of the pitcher! I boil equal quantities of water and sugar together for several minutes, until a light to medium syrup is formed, and then store it in the refrigerator, ready for use in cold drinks. Tired of the same old cake and icing? Take vanilla cake mix or vanilla icing and add unsweetened drink mix. You can add food coloring to match the flavor. It adds a lot of flavor and interest. Warning: As time passes, the flavor intensifies. If not eating in one day, add a little less drink mix. Mix to taste.